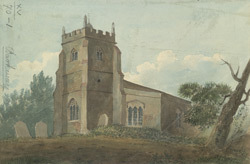 View of the church of St Mary of Magdalene in Barkway, Hertfordshire. There has been a church here since the Saxon period however the earliest part of the church is the chancel which dates from the 13th century. In the 15th century the nave was widened and the west tower was built.